September 2010 – Eternally cool, the military look can hardly be called a trend, but this season it’s being buzzed about more than ever and TechnoMarine is on the frontlines with Cruise Steel Camouflage. The new style, a special series, is an easy but powerful way to incorporate the military trend into your autumn wardrobe. The watch features a colored camouflage design on the dial, matched by a coordinating color strap and contrasted by a bold Black PVD or Pink Gold PVD case. Interpreted in energetic colors like ocean blue and royal purple, as well as traditional shades of army green and desert sand, Cruise Steel Camouflage can be worn as a vibrant take on the trend or a sly nod to timeless institution. Part of the urban Cruise Steel family, Camouflage boasts a Swiss movement and sapphire crystal. 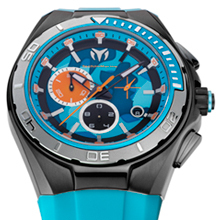 TechnoMarine was founded by entrepreneur Franck Dubarry in 1997, in the French resort St. Tropez. The brand reflected the hedonistic tendencies of its birthplace with an array of bright and flashy styles and quickly became a favorite of international jetsetters and celebrities. Cruise has been the iconic pillar of the brand since the collection first splashed onto the scene. In 1999, TechnoMarine became the first brand to put a diamond bezel on a diving chronograph and, in 2004, was the first to introduce color ceramic watches. In late 2009, TechnoMarine entered a new era of creativity under the guidance of an outstanding new leadership team: Christian Viros, Vincent Perriard and Steven E. Cohen. The team is strategically re-focusing and re-energizing the brand, and is poised to once again make waves in the watch industry.